VBLOC® therapy, which is delivered via the Maestro® system, is an obesity treatment that works by periodically blocking signals from the vagus nerve by using a device similar to a pacemaker. 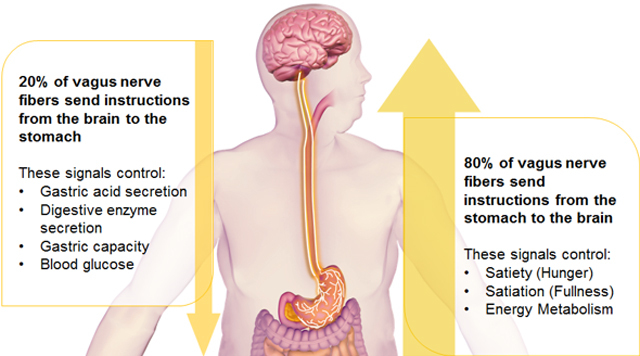 The vagus nerve controls sensations of hunger and fullness. Over time, blocking these signals can lead to weight loss. VBLOC therapy is approved for use in patients 18 and older with a body mass index between 35 and 45, who also have an obesity-related condition such as type 2 diabetes. 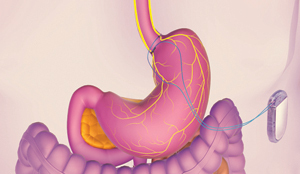 The vagus nerve affects the activities of the stomach, intestine and pancreas. It is the line of communication between the brain and the gastrointestinal and metabolic systems. VBLOC therapy uses a pacemaker-like implant to intermittently block the vagus nerve signals that govern food intake and processing. The vagus nerve can overcome signal blocking when it is done permanently. VBLOC therapy intermittently blocks signals, preventing this effect. The device is implanted during a minimally invasive laparoscopic procedure that leaves the normal digestive system unchanged. The VBLOC therapy system consists of an implantable neuroregulator and two electrodes, which are placed at the trunk of the vagus nerve just above where the esophagus and stomach meet. After the device is implanted, it is remotely programmed by your surgeon. The frequency and timing of signal blocking is unique to you, and determined by your surgeon. VBLOC therapy can be less disruptive than other types of weight loss surgeries. Patients who used the device as directed, for 12 hours per day, experienced a 28 percent excess weight loss on average at 12 months. To learn more about VBLOC therapy, call us at 888-717-4463.